To wrap up our Surveyors Week celebration, we’re highlighting some of our favorite surveying projects. 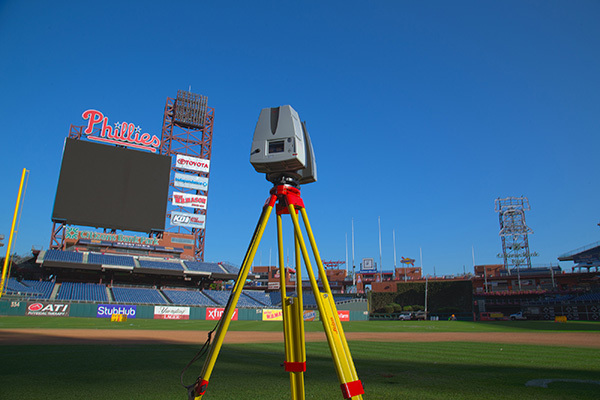 If you missed our previous Surveyors Week post highlighting our surveyors or our post exploring how technology has changed the face of surveying, check those out! Arrowbrook Park is a proffered amenity within a 53-acre, 1.83 million-sf mixed-use, new urbanism development. 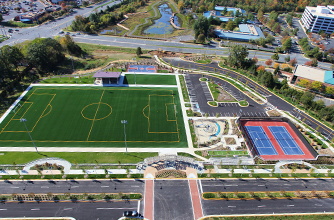 It features a synthetic turf field; active sport facilities, including tennis and basketball courts; a playground with innovative equipment; a custom pavilion providing restrooms, shade, shelter, and picnic/event opportunities; entry features and plaza with a trellis, lighting, site furnishings, and specialty paving areas; and entrance roads and landscaped parking. 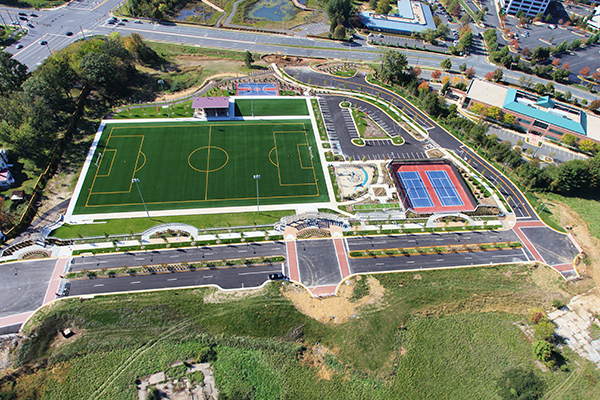 Pennoni provided full civil engineering and construction administrative services, including park planning, landscape architecture, transportation planning and engineering, geotechnical engineering, and land surveying. The Morgan at Provost Square is a luxury apartment complex. The site is a mixed- use residential development within the Powerhouse Arts District in Jersey City, New Jersey. 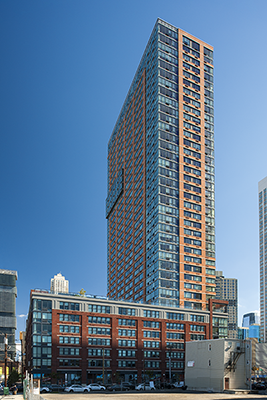 The apartment building is 38-stories containing more than 415 units with the first-floor retail/ mechanical space and a second-floor parking garage. 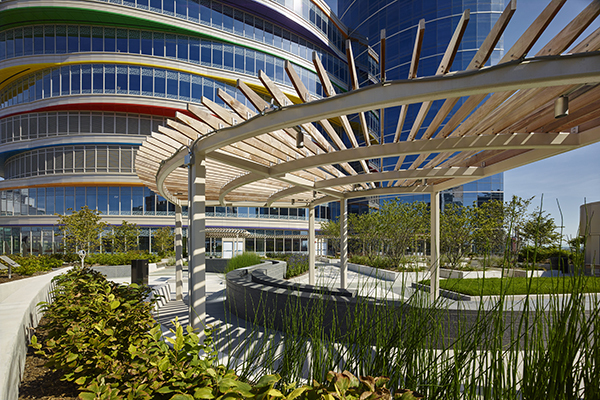 There is a central plaza space and rooftop gardens for residents to enjoy as well. Pennoni provided survey services, civil engineering to prepare site plans and reports, meeting testimony, jurisdictional coordination, and environmental services for Flood Hazard Area (FHA) permit. Additional phases, when complete, will create a pedestrian-friendly streetscape and host a public plaza complete with seating areas. 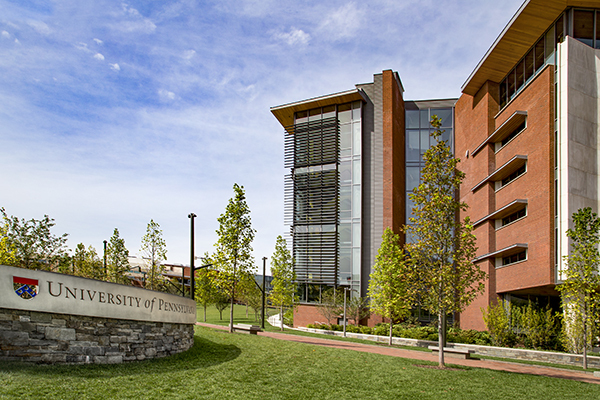 The New College House at the University of Pennsylvania is a 198,000 SF 8-story building providing residences for about 350 students and features dining and resident amenities. The building was designed to provide a sloped lawn next to Woodland Walk, providing privacy for a resident-only accessible courtyard. Pennoni provided civil/site, geotechnical, environmental, survey, and supplemental topographic survey data to support site design and ADA compliant curb ramps. AstraZeneca is a global, science-led biopharmaceutical company. 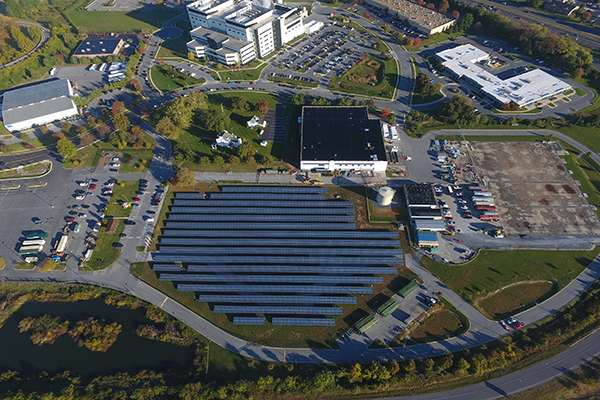 This 1.3 MW photovoltaic solar array project was completed on AstraZeneca’s manufacturing campus in Frederick, MD. The project meets AstraZeneca’s sustainability goals to source 100% renewable power globally by 2025 and offsets the new facility’s purchased power with clean solar energy. Pennoni completed the design-build of this ground-mount solar array and our services included survey, structural, MEP, and civil design as well as land development services through Planning Commission approvals. Pennoni completed the full array design, oversaw electric utility interconnection approvals and construction management, and commissioned the array installation. 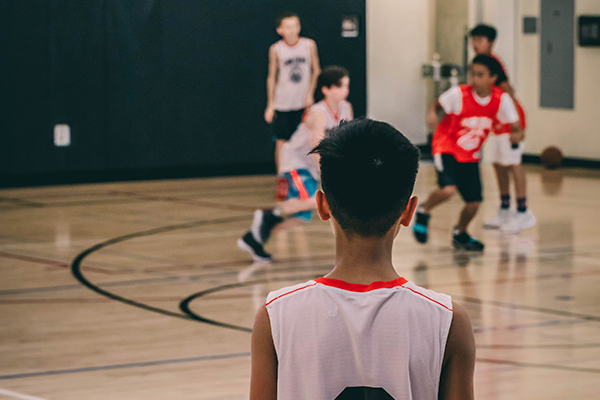 Pennoni’s services included survey, environmental, civil/site, and transportation engineering for field investigations, preparation of reports, and preparation of plans addressing the implementation for the design, permitting and construction of the new facility. Pennoni designed and obtained approvals for the innovative, award winning stormwater management system which included four stormwater tanks and three irrigation tanks. The tanks provide more than 115,000 gallons of storage. The stormwater management was supplemented with green roofs and landscaping which act as the initial catchment for the first inch of runoff.